Dropped atomic bomb on civilians at Hiroshima. Agreed to hold war crimes trials for Nazis. Dropped atomic bomb on civilians at Nagasaki. In many parts of the world, people will pause to commemorate what happened 67 years ago on August 6, 1945, when the United States unleashed the most diabolical weapon in the history of mankind on the city of Hiroshima, Japan. Three days later on August 9th, the same hellish fire consumed the city of Nagasaki. 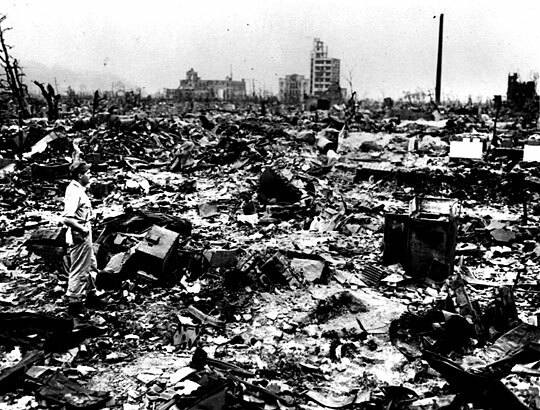 It is estimated that 250,000 people died as a result of the bombs. As many as 60% died from flash or flame burns, 30% from falling debris and 10% from other causes. How will Americans remember this day? Will we come to see it as the war crime that it was? Will many continue to believe the bomb brought a quick end to World War II sparing the lives of hundreds of thousands or perhaps a million members of our armed forces and thus its use was justified? When the US broke the Japanese code, the US government was aware that on July 13, 1945, Japan had contacted the Russians to express their desire to surrender and end the war. President Truman was also aware three months before he ordered the bombing of Hiroshima and Nagasaki, that, according to Swiss and Portuguese sources, the Japanese government, knowing they could not win, wanted to began the process of surrendering. The one thing the Japanese wanted was to retain the emperor. Presidential advisor Jimmy Byrnes convinced Truman that dropping the bombs would allow the US to dictate the terms to end the war. In other words, the US would continue to insist on “unconditional surrender”. In addition to the realization that the war was unwinnable, the Japanese also feared the Soviet Union would soon enter the war on the side of the allies. What was the reaction of America’s top military leaders who led the allies to victory? General Douglas Macarthur, who commanded allied forces in the Far East during the war, stated he was never even consulted about using the bomb against Japan. According to Norman Cousins, consultant to MacArthur during the occupation of Japan, MacArthur stated that had he been consulted, he would have said that he saw no military justification for using the bomb and that if the US would simply have agreed to allow the emperor to stay the war might have been over weeks earlier. General Eisenhower, when briefed on the atomic bomb tests in New Mexico and of the planned use against Japan, expressed his belief that there was no need to use the bomb because Japan was already defeated, and that the US should not shock the world by the use of a weapon that was no longer necessary to save American lives. General “Hap” Arnold, commander of the Army Air Corps, and General Omar Bradley shared Eisenhower’s opinion. Perhaps one of the strongest critics against using the bomb was Admiral Leahy, Chief of Staff to both FDR and Truman. Leahy said, “It is my opinion that the use of this barbarous weapon at Hiroshima and Nagasaki was of no material assistance in our war against Japan.” By dropping the bombs on Hiroshima and Nagasaki, Leahy continued, “we had adopted an ethical standard common to the barbarians of the Dark Ages.” Even former President Herbert Hoover weighed in telling Truman in May, 1945, the if he were President he would, “make a shortwave broadcast to the people of Japan-tell them they can have their Emperor if they surrender, that it will not mean unconditional surrender except for the militarist-you’ll get a peace with Japan-you’ll have both wars over.” In spite of this considered and widespread opposition by senior military officials who prosecuted the war and from a former president, Truman ordered Hiroshima and Nagasaki be bombed. On August 9 as the atomic bomb was dropped on Nagasaki the Soviet Union entered the war against Japan. And when the Japanese government did surrender, they were permitted to keep the emperor. So, 67 years later and after spending six trillion dollars on the development, testing, production and deployment of nuclear weapons the United States and the other nations of the nuclear club have in the aggregate approximately 23,000 nuclear weapons. But progress has been made and we cannot give up hope. In fact there are hopeful signs on the horizon. In February, 2012, the New York Times reported the Obama administration was weighing options for sharp new cuts in the U.S. nuclear force. In May, 2012, the call for a reduction in nuclear weapons received a big boost from General James Cartwright, retired vice chairman of the Joint Chiefs of Staff and former commander of the United States’ nuclear weapons program. General Cartwright said the United States nuclear deterrence could be guaranteed with a total arsenal of 900 warheads. General Cartwright’s proposals are contained in a report issued by Global Zero, a nuclear policy organization. In addition to General Cartwright, the report was signed by Chuck Hagel, former Republican senator, Thomas Pickering, former ambassador to Russia, and others. Perhaps on this August 6, a day when the world pauses to remember and contemplate the first and only use of nuclear weapons, we as Veterans for Peace can renew the pledge set forth in our Statement of Purpose which calls for us to work with others to, “End the arms race and to reduce and eventually eliminate nuclear weapons.” I believe it is time for us to put greater emphasis on this issue and raise public awareness of the dangers of nuclear weapons and the burden it places on the world community and the people of the world who must live under threat of another nuclear holocaust. “A Short History Lesson: 1945” by David Krieger, a founder of the Nuclear Age Peace Foundation, is contained in his award winning book of poetry, Today is Not a Good Day for War” (2005). Thanks so much Barry. All war is barbarism, but August 6, 1945, America surrendered her humanity. Powerful essay. On the individual level the way toward the world free of nuclear weapons begin with the realization that the use nuclear bombs in Hiroshima and Nagasaki was a war crime. However, it is necessary to emphasize that Japanese government could have cared more for its people and less for the emperor. Additional War Crimes were the Firebombing of Tokyo and Germany. And the “repatriation” of Prisoners of War condemned to death upon return to Russia. Our leaders would have been sentenced to hanging or firing squads in a different outcome. “History is written by the victorious”.